Enjoyment and relaxation await you when you arrive at Oma Ella’s. This two bedroom home is located on 168 acres just south of town. The original house was built in the late 1800s and was a two story rock house with outside stairs accessing the second story. It was made of a “rubble stone” (there is a partial of the exposed rock found behind glass in the hallway). In 1940 your hostess’ parents Leo and Ella Hartman bought the house and removed the second story. While they were redoing the house they lived in the smokehouse still found in the back yard. The original front porch is now an enclosed porch and the windows were ordered from Sears & Roebuck. 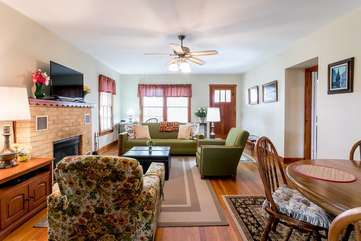 Your hostess remembers many wonderful memories of this great farmhouse, barn, creek and farmland. Entering through the front door leads you into the living/dining room. The living area has a sofa and two comfy armchairs all facing the 40” flat screen television and the electric log fireplace. A dining table comfortably seats four people. The kitchen is on the back side of the house and is fully equipped. A large island is in the center of the kitchen. There is an electric stovetop/range, large refrigerator, coffeemaker, dishwasher, microwave and toaster. There are two bedrooms both with queen beds and both are handsomely topped with tasteful comforters and pillows. There is a bedroom with tub/shower in between the two bedrooms. The back bedroom is spacious and has a collection of antique men and women’s hats. Both bedrooms have 32” flat screen televisions. There is also an entrance onto the enclosed porch. The porch is a wonderful place to relax with it’s comfy table and chairs. There are photos of your hostess’ parents when they were in the process of restoring the house. Very interesting and fun!! There is so much to do in this beautiful countryside. Walk down the road to the Meusebach Creek or just enjoy the countryside. Although the barns are working barns and not for guests you will enjoy looking at their mystique and perhaps see cows in the pens. Besides all of that you will enjoy an abundance of wildlife and birds. SLEEPS - 4 persons; queen bed in each bedroom. The front bedroom will be locked for just two guests- there is an extra person charge for using both bedrooms and two people. My friend and I came out to see the Bluebonnets which were amazing this year! We stayed in 5 different places during our travels and I must say that Oma Ella’s was our favorite! The peaceful farm setting was perfect for us city girls as we were transported back to our country roots. We walked to the creek several times and even met the sheriff’s deputy who gave us photo tips. We loved reading about the history of the home and seeing photos of the sweet couple who lived there. The farm fresh eggs and baked goods served as breakfast and even supper some nights! In fact we ate on the spice cake at our next stop! Oma Ella’s is definitely at the top of our list for next year! A wonderful, cozy little farmhouse, far enough from town to be seclusive, close enough to enjoy all sights and activities Fredericksberg has to offer. Fresh-baked goods were delivered every day, along with eggs and sausage for breakfast and a complementary bottle of wine to boot. Very nice and comfortable home. Beautiful setting. Had everything we needed and nice treats provided by owners. So pleasing. This was our 2nd time at Oma Ellas. Very nice, clean, well kept place. Baked goods are awesome. We will be back next year.